Do you see one of our Stock Covers that you absolutely love but want to create your own custom dividers? Is there a set of dividers that you'd like to use with a Stock Cover that's different then the one we're showing with those dividers? Maybe you have a very custom front cover in mind for your book but you'd like to pair it up with one of our Stock Divider sets? 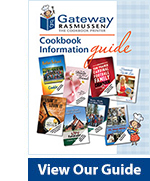 At Gateway Rasmussen you are welcome to Mix & Match. Take the Cover from one set and pair it up with the Dividers from another. Create your own Custom Cover and use one of our Stock Divider sets. Whatever you want! It's your cookbook - it's your project. We're just here to help you make it a reality! Just specify on your Cookbook Order Form what it is that you'd like to do.